where thousands of people come for their own reasons. To escape one society to become a part of an experience that can only be explained by attending. and that you do not pass judgement on those who call themselves "Burners" until you have the opportunity to have your "own" ! Photos are not for sale. All descriptions of the art were written by the Artists themselves. 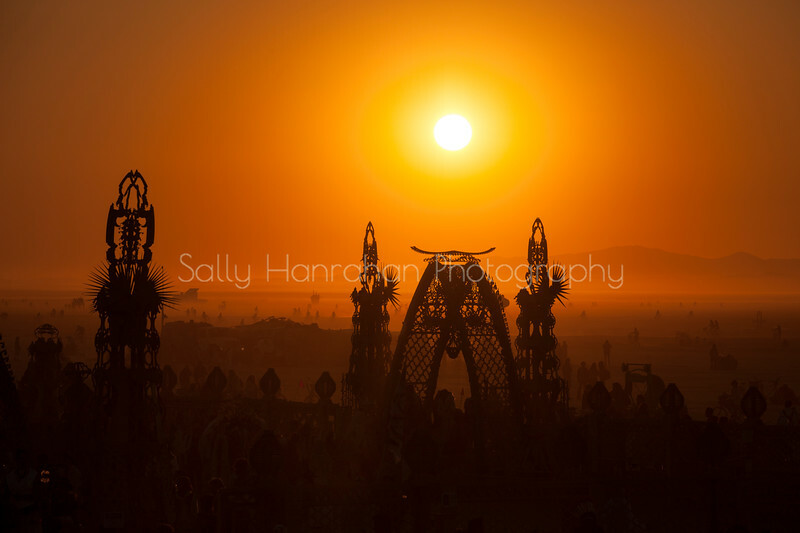 Burning Man in the Black Rock Desert by: David Best from: Petaluma, CA year: 2014 The Temple of Grace is intended to be a spiritual and sacred space for memorials, reflection, celebration, and to commemorate life transitions. It is the latest in a long line of temples going back to 2000, which started the tradition of the temple built as a spiritual center for this art festival. It is a special work of art given to the community, and is a spiritual refuge where thousands gather, each to engage with it in his or her own way. The community comes to write their memorials and place tokens of their transitions, and it is burned at the end of the festival in a tradition of releasing them by the immolation of the temple. Desert outside of Gerlach Nevada. 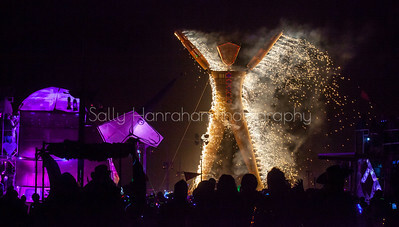 Burning Man in the Black Rock Desert outside of Gerlach Nevada. 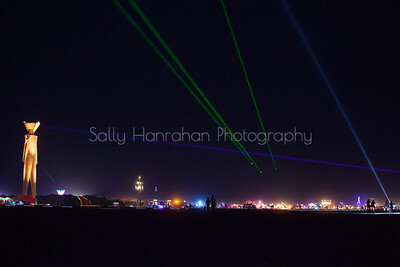 Burning Man in the Black Rock Desert outside of Gerlach Nevada. by: Dan Fox year: 2014 The Alien Siege Machine is a ghost ship. It travels through space and time imperiling all it encounters. Appearing throughout the epochs, crews are enslaved and are driven by a mysterious rancor to pilot the Machine into battle, often adding their own technology as they feverishly execute another volley of combat against the very civilization from which they came. The Alien Siege Machine’s immortal and profane war has come to our time and place. 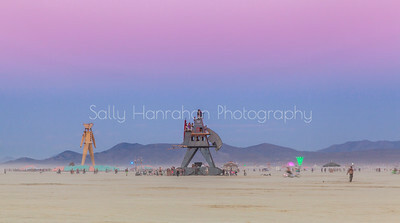 Now it sits on the playa, battle wounded, but battle-ready. God save us all. 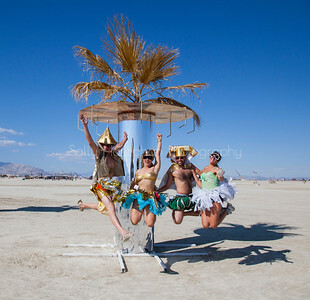 I am Miles Eastman, I have been in charge of getting the God booth to the playa for the past 4 years. 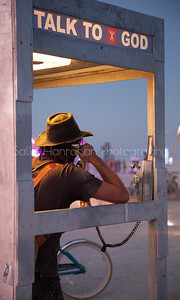 I started coming to Burning Man in 2005 with OBOP the camp that created the TALK TO GOD phone booth. (Drawings of the new booth design coming very soon) The TALK TO GOD phone booth is an interactive instalation that has touched the hearts, minds and souls thousands over its 14 year history. This simple two way phone line a phone booth a God throne about 100+ft away, facilitates two strangers the chance to have some of the most intimate and profound conversations of their burn and their lives. There is the right god for you on the other end of the line every time. Fledgling by: Christian Ristow from: El Prado, NM year: 2014 Fledgling is a large mechanical bird, powered by a single human operator. One person at a time is allowed to climb a staircase up the tail-feathers and climb into the rib-cage, where they sit in a seat and assume the position of a recumbent bicycle rider. By pedaling a set of bicycle cranks, the operator sets in motion an intricate arrangement of chains, sprockets, gears and cranks which surrounds them and powers the wings, which open and close and simultaneously fold inwards towards the body, much as a real birds wings do. Fledgling is constructed almost entirely of stainless steel, with small amounts of carbon steel and aluminum. 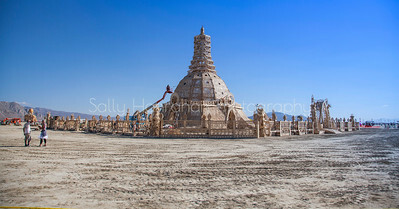 Burning Man is held in the Black Rock Desert outside of Gerlach Nevada by: David Best from: Petaluma, CA year: 2014 The Temple of Grace is intended to be a spiritual and sacred space for memorials, reflection, celebration, and to commemorate life transitions. It is the latest in a long line of temples going back to 2000, which started the tradition of the temple built as a spiritual center for this art festival. It is a special work of art given to the community, and is a spiritual refuge where thousands gather, each to engage with it in his or her own way. The community comes to write their memorials and place tokens of their transitions, and it is burned at the end of the festival in a tradition of releasing them by the immolation of the temple. by: The Pier Group from: Reno, NV., Portland, Or. and Vancouver B.C. 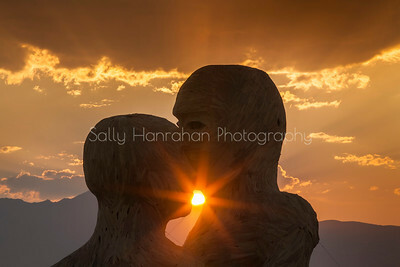 year: 2014 Embrace is a 7 story tall wooden cathedral-like sculpture of two human figures in an embrace. 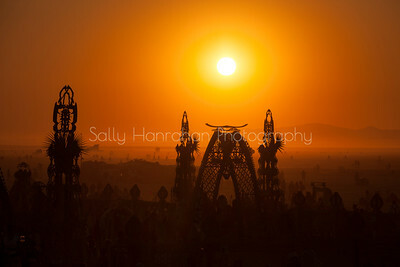 It is a spiritual center dedicated to the moment and our relationships with our loved ones. 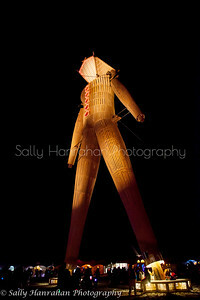 We hope to create a new tradition at Burning Man of a third recurring structure dedicated to the now. 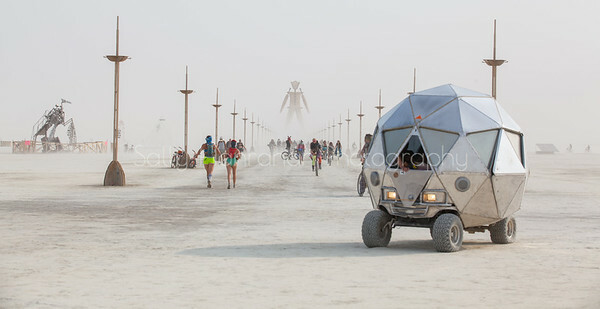 The art cars at Burning Man can be stranger than fiction. 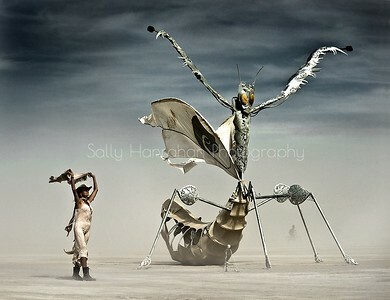 Burner Photographer, Ales Prykeryl photographed me with Flying Mantis by Heather Dessel at Burning by: Heather Dessel from: tempe, AZ year: 2014 Flying Mantis is a metal mantis, spread-winged and ready to fly. He’s a lover and is all fired up, literally, ready to find his mate. 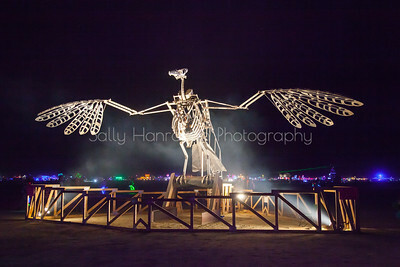 Made of galvanized steel and lit up at night. He blends in with the leaves, stalking his prey, protected. His power pose represents the strength and importance of nature, something to which we should all humble ourselves. 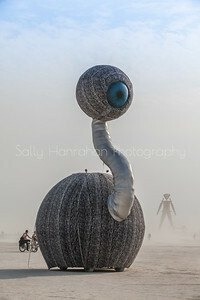 Burning Man is held in the Black Rock Desert outside of Gerlach Nevada Theme and text by Larry Harvey and Stuart Mangrum. Animation by Hugh D’Andrade. “The spectacle is not a collection of images; it is a social relation that is mediated by images.” – Guy Debord, Society of the Spectacle This year’s theme is about mirrors and masks, mazes and merger. 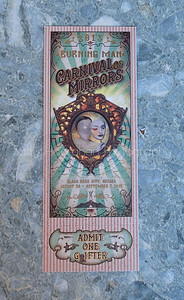 It will be a kind of magic show that takes the form of an old-fashioned carnival. This Carnival of Mirrors asks three essential questions: within our media-saturated world, where products and people, consumption and communion morph into an endlessly diverting spectacle, who is the trickster, who is being tricked, and how might we discover who we really are? Classic carnivals, as theaters of illusion, upheld a very strict dividing line that separated carnies, cast as showmen, from members of a naïve public who were labeled chumps and suckers, marks and rubes. Our carnival, however, will perform an even more subversive trick — its motto is Include the Rube. The wall dividing the observer from observed will disappear, as by an act of magic; through the alchemy of interaction, everyone at once can be the carny and the fool. 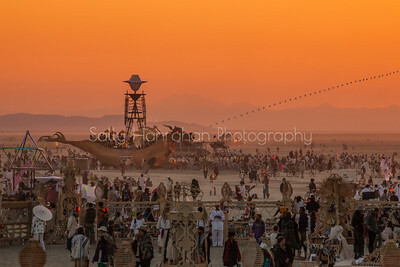 Burning Man in the Black Rock Desert outside of Gerlach Nevada by: Dreamers Guild from: San Francisco Bay Area, CA year: 2015 A Temple’s purpose is to provide a safe space where the diverse and essential needs of the soul can take root and grow or surrender and find solace. This year, the Temple of Promise welcomes participants through an archway soaring 97 feet overhead. Once inside, the structure curves in on itself, tapering in width and height down to just 7 feet tall. Along the way, alcoves formed by the supporting arches, as well as wooden sculptures reminiscent of stones in a stream, create altars and semi-private spaces for individuals and smaller gatherings. The lines of the curved wooden walls draw the eye inward and create a canvas for written messages and mementos. As the path continues to curve, it opens into the contemplative altar and the heart of the Temple: a grove of three sculpted trees. The branches are initially bare. Participants will write messages on long strips of cloth and attach them to the trees, creating the gentle shade of Weeping Willows, increasing as the week progresses. The Temple of Grace is intended to be a spiritual and sacred space for memorials, reflection, celebration, and to commemorate life transitions. It is the latest in a long line of temples going back to 2000, which started the tradition of the temple built as a spiritual center for this art festival. It is a special work of art given to the community, and is a spiritual refuge where thousands gather, each to engage with it in his or her own way. The community comes to write their memorials and place tokens of their transitions, and it is burned at the end of the festival in a tradition of releasing them by the immolation of the temple.